SRINAGAR: JRL comprising Syed Ali Geelani, Mirwaiz Umar and Yasin Malik had asked people to march towards historic clock tower at Lal Chowk, while carrying placards “what Kashmiris want” to protests Modi’s visit. 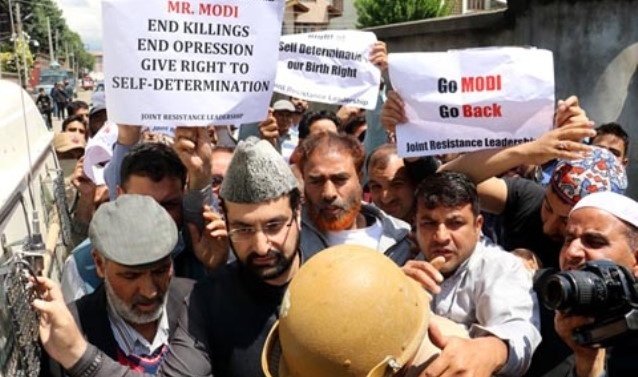 The authorities on Saturday foiled the ‘Lal Chowk Chalo’ march called by Joint Resistance Leadership (JRL) to protest Prime Minister Narendra Modi’s visit to the region with curbs and detentions. JRL comprising Syed Ali Geelani, Mirwaiz Umar and Yasin Malik had asked people to march towards historic clock tower at Lal Chowk, while carrying placards “what Kashmiris want” to protests Modi’s visit. Modi inaugurated circular ring road project and dedicated Kishenganga power project to the people at Sher-e-Kashmir International Convocation Center (SKICC) on the banks of Dal Lake. Earlier, today morning historic clock tower called ‘Ghanta Ghar’ in local parlance was kept out of bounds for people as the area was completely sealed off with contingents of forces personnel manning the roads leading towards it. The capital city Srinagar was placed under thick security cover with educational institutions, commercial establishments and offices closed. Security was heightened in Srinagar with areas around SKICC, the venue for the PM’s function kept under tight security cover. Hurriyat (M) chairman Mirwaiz Umar Farooq tried to take out a protest rally from his Nigeen residence towards city center Lal Chowk, but contingents of forces personnel prevented him from marching ahead. Later, Mirwaiz was detained in Nigeen police station. Hilal Ahmad War, a leader of the Mirwaiz-led Hurriyat faction and chairman of People’s Political Party was also detained by police after he tried to take out a march from his Maisuma residence. He was lodged at Kothibagh police station. Similarly, Hurriyat (G) chairman Syed Ali Geelani was confined to his home as he was not allowed by authorities to move out from his Hyderpora residence to take out a protest rally towards Lal Chowk.